This day we waited around half the day for the skies to open up so we could get at the wave lift. Earlier in the morning the wave cloud over the field was obvious but then the sky filled in so we waited. After lunch we saw some shift of a hole in the clouds from the west and we pulled the gliders to the north end of the field for launching. As one after another of the sailplanes went aloft the sky opened up and pilots were getting to better and better heights. The highest being about 12,000 ft. I had resigned myself to not flying that day since, I had had two good flights this week. However, Steve and Richard convinced me to go up in the ASK21, which I hadn;t flown yet. So up I went with Richard to have the last flight of the week. I did the take-off and followed the tow plane up under the clouds. 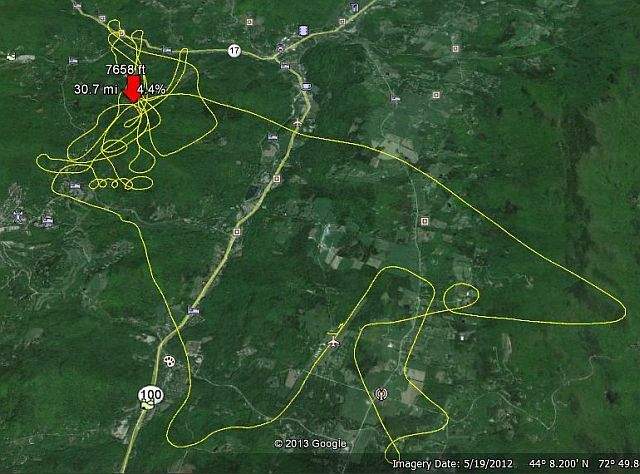 The sky had filled in again by the time we went up and the only hole was west over the Sugarbush ski area. All the other flights had been towed in the secondary part of the wave to the east of the field but now we had to head for the primary. Those other flights got into the wave with tows as low as 2000 ft agl. I was watching the variometer and even at 3000 ft agl we did not have great lift, but when we were pulled out into the clear hole, I released into very light lift of less than 100 ft/min. This was getting us nowhere, so I looked around and drifted back under the cloud. Wisps of cloud associated with rotor were there and we found more lift on the up wind side. So I did some circling in that rougher air and got up higher. As you can see from the height profile, we climbed slowly for awhile. We started out at the bottom of the cloud and climbed up throught the hole. Only when we were nearer the top of the cloud did the wave lift increase and we climbed above the clouds. 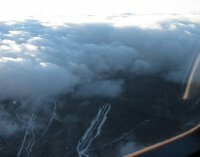 Our maximum height was less than 8000 ft and we still had good lift (about 400 ft/min) but the wave hole was decreasing in size and we had to descend quickly so as not to be trapped above the cloud. Once we were below the clouds we flew west to the field and past to the east ridge but found only sink and had to land. Our flight was less than an hour long but I had enjoyed the challenge of climbing in rotor to get fully in the wave lift. The view above the clouds were also beautiful and rewarding.